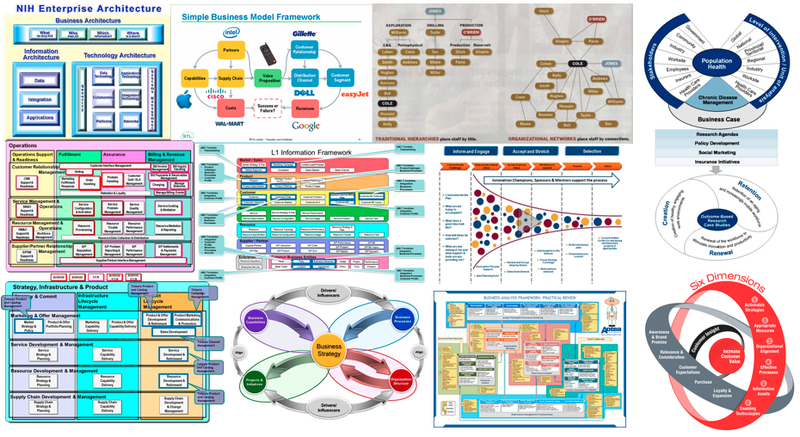 The image above shows a collection of business frameworks gleaned at random from Google images. If you do the search yourself you will find hundreds more diagrams like this, and they are of course more than familiar to everyone. What I would like to draw your attention to is that in all of these frameworks, the analyst has broken their model down into parts, and drawn connections between these parts. Analysis, where we break a system down into parts is the default mode of consciousness of our scientific-industrial culture. It is a mode of consciousness which favours distinction and separation, and the conception of discrete objects. Two of these metaphors are clearly organic; Organisms and Flux and Transformation, and the Brains metaphor to me seems highly computational, with no reference to conciousness. The analytic, verbal and logical mode of consciousness favours a conception of reality based on solid objects, but what of the other mode of consciousness, a holistic mode of consciousness , one that is concerned more with relationships than discrete entities? This mode of consciousness is complementary, but it has to be entered into in its own terms, and not understood from the perspective of the analytic mode of consciousness. In this mode of consciousness, relationships which exist within systems are experienced in the intuition, allowing us to experience the whole system. To reach this experience we therefore have to undergo a transformation in our consciousness. Notice how Brady is shifting us away from understanding organic living systems as objects (‘finished works’) to a more verb-based dynamic process-based comprehension, which understands organisms as ‘wholes’ ever changing to remain the same. We are always hearing the call to shift our paradigms, and move away from outmoded mechanistic ways of thinking, but this is no easy task, for what it entails no less is the transition of consciousness.